← Viet-nom-nom: A Food Trail from Saigon to Hanoi. 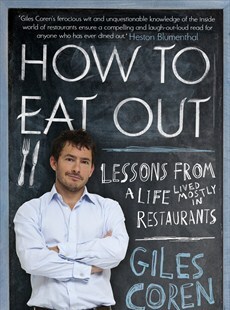 I spent the majority of last week with my nose buried within the orifices of Giles Coren’s ‘How to Eat Out’. Coren rarely has anything nice to say about any restaurant, unless the price is nice. I am a stingy diner, firstly because I’m young so I don’t have many Queen sheets in the bank and also I can’t understand how anything over thirty quid could ever reflect a plate of food, unless I do dine in the Fat Duck where my plate will probably double up as a dry ice machine, but of course there it will cost two-hundred pounds. Until I do earn the dosh, I’ll stick to home cooked food, street food and the cheapest dish off the menu. Even though Giles does state that food bloggers are ‘flabby people taking photos of everything on their plates’, I can forgive and forget, as he has been willing to turn the appearance of his own life into a huge shambles in order to anecdote an endless list of crap restaurants he has had to visit for the sake of his job, which he isn’t that fond of either. If you don’t know, Coren is a British food critic for The Times (and winner of best Food and Wine writer in 2005) so you can trust every one of his miserable statements. He has also given me the courage and inspiration to slate a restaurant I previously admired and dined at for high-tea and wrote a rather pleasant review for called An Affordable Afternoon Tea: Brown’s Restaurant. If you’ve read the previous review, the following will appear as though I have split-personality-disorder, but this is only due to a p***-taking second visit. On February 10th I re-visited the franchise ‘Brown’s’ in Covent Garden and ordered from their ‘Lunch and Early’ main menu. Mains started at £11.95 and desserts were mainly £5.95. My friend ordered The Browns Burger with ‘beef, bacon and emmenthal…our tomato and garlic compote served with dill pickle, apple and celeriac slaw’ and I, fancying something sweet, ordered off the pudding menu the ‘Bread and Butter Pudding’ made from ‘Brioche, coconut, cardamom and custard’. This was after a strenuous finger-biting wait, admittedly, we did send the waiter away the first (and perhaps a second) time as we were still deliberating, but our polite dismissal unintentionally offered our waiter the opportunity to abandon us to the point that I felt it appropriate to put my finger in the air, modelling a well-behaved student, in order to get attention. Phew. Finally someone came running over, we gave our orders, he rolled his eyes as if to say ‘finally’ (yeah, we were thinking the same, mate) and toddled off. A ridiculous forty-five minutes later for one flippin’ burger and one bread and butter pudding, which I was starting to wonder why the heck I ordered as it’s only bits of soaking bread in egg and milk, which I could have gone home and cooked by now, arrives! Which gave us full permission to re-enact some eye-ball rolling. Ten seconds later my friend runs gleefully back to the table from the toilet, she had gone in a desperate attempt to alleviate her hungry thoughts and in the secret hope of her food arriving behind her back, which it did, I always practise this toilet-trick, it always works hands-down. Just as she was about to greet her burger with the huge teeth-sinking she’d been waiting for, she touches her plate: cold, and then her burger: even colder and both our faces become: red.hot.with.ANGER. A forty-five minute wait for two of the earth’s most easiest dishes and they arrive cold? Can a well established pricy institute as Brown’s really be disregarding a fundamental food-serving rule, to heat plates?? Immediately my finger re-emerged to pull our arrogant waiter over, we explained the situation (nicely, of course), and he, in reply, re-explained the situation which us ‘numb-skull’ youths obviously didn’t understand: ‘well you weren’t here when I put your food down, it’s because you left it there’. Ermm, if she was there ten seconds before-hand and if she can eat her food like an obese person going cold-turkey, then yes you’re right it would have been a warm (not hot) meal, otherwise, I severely DOUBT there was ANY chance of her enjoying this hyped-up not-worth-eleven-quid burger with pompous sauce even if she had been present at the food’s arrival. Eventually, he took her plate away. In the meantime I took baby-bites of my ‘fancy’ Bread and Butter Brioche, firstly because I didn’t want to finish the thing off before my friend received her second burger, and secondly, you needed binoculars to see this pretentiously portioned dessert. I couldn’t taste the Cardamom or the coconut and as this was soaked in custard it could have been Brioche or a slice of Tesco Value bread under there, so this was just your average bread-and-butter pudding, just served in a neat square in the centre of an unnecessarily large plate. At last, the second burger arrives. It’s slightly warmer, I wouldn’t say hot, maybe try turning the oven up eh Brown’s? And, we eat! My friend, who is past the point of hunger now and would have happily settled for a packet of Doritos from an off-license for 50p is now forcing an eleven quid burger down her, and I’m sitting their with one baby mouth-full of cold pudding and a jug of custard with a skin on top. So what I believed to be (I quote myself) ‘exceptional’ service is now ‘shite’ and when I claimed this place was not pretentious, I was clearly kidding myself. Saying that, I will probably return for their high tea as it’s fun with friends, it fills a hole, you can’t go wrong with a bit of jam and Scone and it’s bloody cheap (I must add that the waitress we had last time was rather good). But spend anymore money here, order off a different menu and you’ll only leave bitterly disappointed and, like Giles, not wanting to endure eating out again. Thank you very much! It is frustrating isn’t it, especially when what you want is so simple. Yes, read the book, but read it slowly and savour it as you’ll be at a loss with what to read once it’s over! I loved your piece on Browns and sometimes it depends who is cooking and serving on the day. I will read Giles book too, but he is also missing out if he doesn’t read this blog, it’s amazing. One of the best meals out that I had recently was a sea bass tagine with all the trimmings in Kingston Market. It is an outdoor/indoor part of the market with all the ambience of Morocco for the princely sum of £6 with all the hot mint tea you could drink and great, friendly service. Thank you for your kind words! Well your Moroccan meal certainly begs the question, why pay more? I admit the same dish at a different price can change my perception of a dish. When something is expensive, you expect more. There’s this place that used to be an old favourite of mine, but now that their $6 pies and $7 wraps are now $8.50 pies and $10 wraps, they don’t taste nearly as good. I’m sure if they were the same pies and wraps for $4 and $5, they would somehow taste wonderful. Thoughts? Oh, I completely understand. I would have probably thought this bread and butter pudding tasted heavenly if it was £2! The dish must reflect the price, if it’s pricey it must be incredible, and the majority of the time expensive dishes fail to live up to this expectation making you feel cheated and not worth giving it your seal of approval! Maybe you should have tried the bread board… Stale bread with an “assortment of” (two) flavoured butters. One flavour being…salted. HUGE cop off. I was going to include this too, but I felt I’d moaned enough about these two dishes! Possible BallAcheDiary post? I’ll link it up on here if you do!